Thousands of people have demanded that more Canadian women be shown on the country's bank notes, and at least two opposition MPs are listening. NDP MP Niki Ashton, the party's status of women critic, and Victoria member Murray Rankin have written a letter to Bank of Canada Governor Stephen Poloz in support of a campaign calling for better gender equality on Canada's cash. "Many Canadians have expressed disbelief and embarrassment that our currency does not, in 2014, equally recognize the contributions of women and men to our national story," they state in the letter, dated Jan. 8. "Our banknotes are an important opportunity to celebrate the diversity of our country and the innumerable contributions to its history made by people of all genders, ages, religions and ethnicities." The letter follows a petition started by Victoria resident Merna Forster, that also urges the Bank of Canada to add women from Canadian history to its money. More than 53,000 people had signed their names to the petition as of Saturday morning. The only woman displayed on Canada's polymer bills is Queen Elizabeth II. Women's rights activists "The Famous Five" could once be found on the $50 bill, but they were later replaced with the image of an icebreaker. 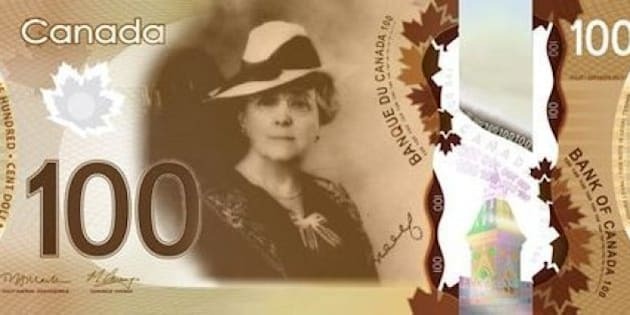 Forster has also started a website, "Women on Canadian Banknotes," where members of the public can generate their own ideas for who should be displayed on polymer notes. Users have suggested women such as author Lucy Maud Montgomery and artist Emily Carr. Poloz responded to Forster in a November 2013 letter. He complimented her petition and said the bank would embark on a review of how polymer bills are designed. Bank of Canada spokeswoman Josielle Ménard said in an email that it has "completed a review of the process used to select and design the visual content" for its latest series of polymer notes, which recommended that input be sought from more Canadians. "We invited Canadians to review the principles and provide their views," she wrote. "These principles and the feedback received from Canadians will guide our recommendations to the minister of finance when it is time to develop and select visual content for the next series of bank notes." Bank note designs are ultimately approved by the minister of finance under the Bank of Canada Act. As for the current series of bank notes, which was introduced between 2011 and 2013, Ménard said it is intended to "depict Canada's exploits and accomplishments, endeavors [sic] in which Canadian women and men have contributed." Ménard said its current polymer designs honour the "collective accomplishments of Canadian women and men," including the Canadian Coast Guard research icebreaker on the $50 bill, and the Canadian National Vimy Memorial on the $20 bill.